Come to our 3rd Annual Spring Gala! 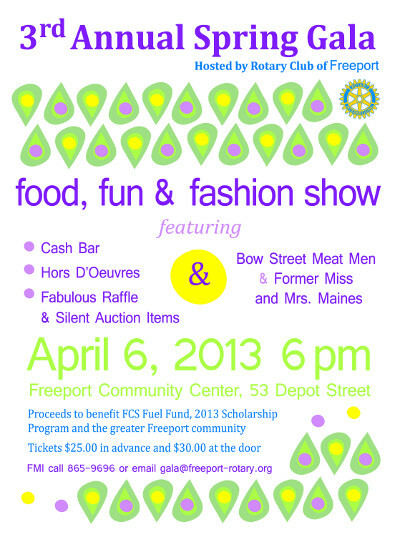 Freeport Rotary Club is hosting its third annual “Spring Gala Fashion Show” on April 6, 2013 at the Freeport Community Center. The event starts at 6:00 pm, with the fashion show beginning at 7:30 PM. This year’s event is sure to be a good time with delicious appetizers and cash bar (beer and wine), a great line up of models, fashion, raffles, silent auction items and a live auction item for a dinner with Senator Angus King and his wife at Buck’s Naked BBQ (donated by Senator King and his wife). In the past, we have had the privilege of having members of Freeport’s Fire and Rescue, as our highlighted models. This year someone mentioned the attractive folks working in Bow Street’s meat and deli department. So for this year’s event, we are lucky to have the “Bow Street Meat Men”, along with a former Miss Maine and a former Mrs. Maine and several other models who are participating in this year’s fundraiser. Proceeds from the event will benefit the Freeport fuel assistance program, the Rotary scholarship program, along with the Freeport high school Interact Club’s effort to return to La Romana, Dominican Republic to provide clean water to those in need. Tickets to the event are $25.00 in advance and $30.00 at the door. They can be purchased by calling 865-9696 or by emailing: gala@freeport-rotary.org. We look forward to seeing you all there!